After a period of strong growth, economic activity in Latin America has slowed sharply. Growth among the six larger, financially-integrated economies—Brazil, Chile, Colombia, Mexico, Peru, and Uruguay—is expected to be negative this year. With heightened financial market pressures and limited policy space, the credibility of policy makers is being seriously tested. In this challenging environment, policy-makers in these six countries face some difficult questions: how to strike the right balance between smoothing the adjustment and strengthening credibility? What role should fiscal policy play in this new, uncertain and rapidly evolving environment? These and other questions will be addressed at the Annual Meetings in Lima, Peru next week. As we prepare for these meetings, we offer our thoughts on some of the pressing issues for Latin America. During the boom years, the region benefitted from sustained high commodity prices. For instance, in the case of Chile, windfall gains to income owing to stronger terms of trade from the boom in commodity prices amounted to about 185 percentage points of GDP in cumulative terms over 2003-12, and almost half that in the case of Peru. 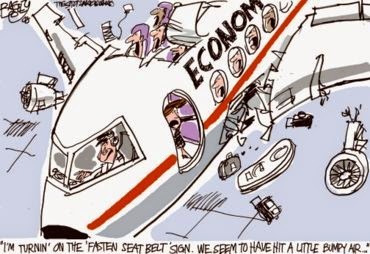 This allowed countries to build fiscal buffers and to deploy counter-cyclical budgetary policies in response to the crisis. In the case of Chile, for example, the overall fiscal balance declined in the wake of adverse macroeconomic shocks, and discretionary stimulus (reflected by a 4 percentage points of GDP fall in the cyclically-adjusted balance over the period 2007-09) provided a significant cushion to the economy. The situation today is very different. First, the external environment is shifting, led by the sharp decline in commodity prices over the past few years. China´s growth slowdown and economic rebalancing has translated into a significant deterioration in Latin America’s terms of trade that is not expected to recover any time soon. At the same time, financial conditions are poised to tighten in the context of U.S. monetary policy normalization. The change in the external environment and the sharp regional slowdown has led to a sharp decline in Latin currencies, capital flows and equity prices and an increase in interest rate spreads. Second, the external shock has been compounded by domestic impediments. These vary by country, and include political imbroglio, low confidence, rising household and corporate leverage, as well as structural rigidities, such as limited economic diversification and lagging trade performance. Moreover, with some of the current headwinds being seen as permanent, economic agents are reassessing the strength of regional macroeconomic fundamentals and policy frameworks. All this, compounded with relatively low levels of investment and weak productivity growth, has translated into the slowest regional growth rates in a decade with longer-lasting adverse effects. 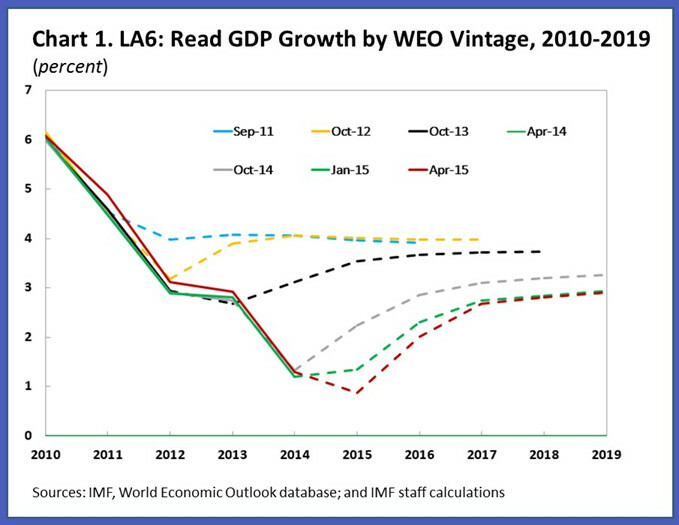 Consequently, medium-term growth prospects have been marked down (Chart 1). In this environment, budgets are under pressure. Following a short rebound after the crisis, budget balances started to deteriorate as government spending in Latin America’s six larger economies increased (by an average of 3 percentage points of GDP) while commodity prices were still relatively high. Now, the fall in commodity prices and the slowdown in growth have led to a fall in fiscal revenues. Overall, the fiscal deterioration has gathered pace alongside the worsening of the domestic environment and mounting external pressures. Given the magnitude and persistence of the shock, adjustment is unavoidable. This said, many of Latin America’s six larger countries will see negative output gaps in the short run. Therefore, a fundamental question is—what role should fiscal policy play in this new, uncertain and rapidly evolving environment? 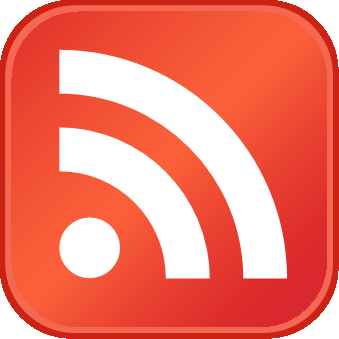 Is there scope for fiscal policy to play an active stabilization role? After all, counter-cyclical policies during the global financial crisis contrast favorably with many past episodes of crises and pro-cyclical policies in the region. Reality, however, is more complex and demanding. While the public debt outlook appears generally manageable in these six countries, the incomplete reversal of fiscal stimulus implemented in response to the crisis has significantly reduced fiscal buffers. Only Chile managed to close the structural deficit by 2012, but the deficit has deteriorated again since then. 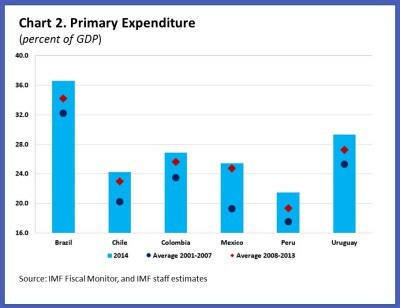 In addition, revenue policies have not kept pace with spending (Celasun and others, 2015), which has either persisted at the elevated levels (Chile, Colombia, and Mexico) or risen further (Brazil and Uruguay) since the crisis (Chart 2). In addition, current outlays—such as pensions, social protection, and health—have also gone up in all countries except Peru and, to a lesser extent, Colombia, making the retrenchment of spending politically and socially difficult. Finally, fiscal risks stemming, for example, from state owned enterprises and the financial sector are a further source of fiscal vulnerability. Against this backdrop and the current juncture—when there are clear risks of capital flow reversals and credibility is at a premium—we would argue that the main role of fiscal policy in these six larger countries should be to anchor expectations and to facilitate adjustment. The desired size, timing, and pace of consolidation varies across countries, depending on the prospective debt dynamics, macroeconomic outlook, and market conditions. 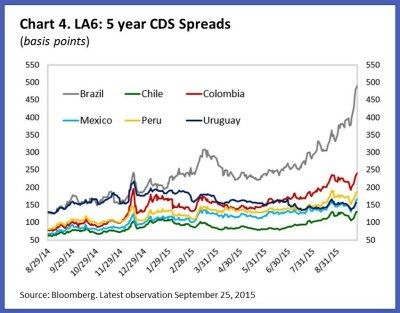 In Brazil, there is an urgent need to put debt ratios on a downward path. 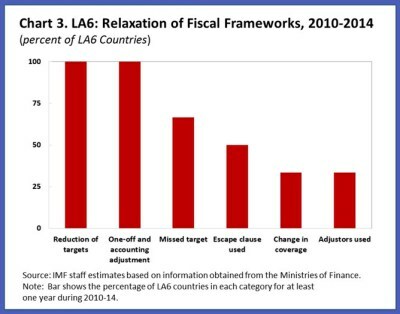 In Uruguay, the fiscal position should be strengthened over the medium term to reinforce fiscal sustainability. Colombia and Mexico face more moderate public debt burdens, but fiscal tightening will also be required to accommodate lower-than-expected revenues owing to weaker oil prices and slower potential growth. In Chile and Peru, where public debt levels remain well below that of other emerging markets, there is more room for a gradual adjustment, but their vulnerability to commodity price shocks underscores the importance of eventually adjusting to lower metal prices. 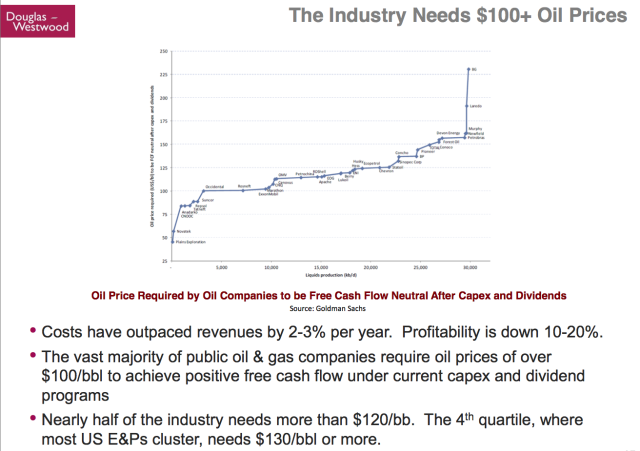 Ultimately, how much fiscal latitude is available depends on confidence and credibility. From that perspective, it is imperative to maintain—and in some cases re-establish—fiscal anchors. The fundamental objective should be to ensure a solid financial position for the general government. Compliance with the rules and procedures that make up national fiscal frameworks is an important element to achieve this goal. The recent experience during the global financial crisis is mixed in that respect. 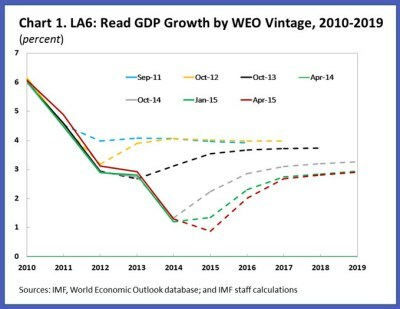 In particular, despite a robust recovery taking hold after 2009, medium-term fiscal objectives were frequently revised and rules bent to various degrees (Chart 3). The difference this time around is that, with emerging markets facing heightened uncertainty, markets are sharply discriminating between countries with a long-track record of credibility and those where policy and political risks have accumulated in recent years (Chart 4). Commodity producers such as Chile, Colombia, Mexico, and Peru should rely on a diversified revenue base and should, therefore, avoid an overemphasis of government spending on the resource sector. In addition, greater effort should be focused on bolstering public investment management and strengthening expenditure policies, to ensure that government spending plans are efficient and effective, which would, in turn, create fiscal space and generate growth dividends. Finally, the on-going commodities price roller-coaster underscores the importance of having fiscal frameworks that build sufficient precautionary buffers to deal with uncertainty (more on that in the forthcoming Fiscal Monitor, October 2015). Most countries in Latin America are at a difficult cross-roads. Experience from the 1990s and 2000s shows that they were able to adjust and implement structural fiscal reform despite unfavorable conditions. Once again, Latin America faces uncertain times and difficult choices.